Selected items from the Shoreline Police blotter, two weeks ending January 22, 2018. Trending: family disturbances / domestic violence: DV with assault ends in arrest (2); CPS called after woman hit daughter in thigh with a flip-flop; argument between mother and son over a cell phone during custody weekend, grandparents interfere; man assaults his grown son, booked into jail; mother and son disturbance; 13 year old boy doesn't want to go with father on visitation days. 01-05 Man paid cash for a cell phone from a seller in the Safeway parking lot. Cell phone is locked. 01-06 Male reports he was locked in a house for days. 01-07 Man with history of assaultive behavior toward deputies is loitering outside police station. 01-07 Larceny from apt at Linden Highlands. 01-07 Mentally ill subject concocts story about being locked out of her apt to get attention from fire and police. 01-08 Bicycle stolen from Y. Video of suspect. 01-08 Suspect who stole large cart of groceries from Central Market was in possession of a stolen handgun. 01-08 Purse stolen from shopping cart in parking lot of QFC on RB road. 01-09 Burglary at 15xx NE 171st while owner was away for the night. 01-10 Property tagged with graffiti and generator stolen from scrapped camper at Evergreen RV. 01-10 Students at Einstein caught selling marijuana. 01-10 23xx N 192nd St - both license plates on vehicle stolen and swapped out with a stolen car's plate. 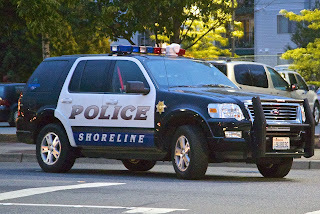 01-10 Vehicle stolen from Shoreline Pool. 01-11 Resident at The Blakeley taken in again for alcohol detox. 01-11 Convicted felon trying to buy a gun at Big Five so he can kill police. 01-11 67 year old woman Trespassed from Goodwill after stealing a blanket to stay warm and toys for her grandchildren. 01-11 Package of dog food stolen from front porch at 199xx Linden Ave N.
01-12 Person with mental issues was tased by officer after he refused to drop the needle in his hand. No injury to either. Taken for involuntary commitment. 01-13 Suspect broke into house at 17xx NE 146th but didn't take anything. 01-14 Mail theft of unlocked boxes 167xx 8th Ave NE. 01-14 Burglary 22xx NE 175th through unlocked back door. 01-15 180xx 7th Ave NE, 1:15am - missing person found after call to report someone in the street screaming. 01-15 Burglary to I-Vape store 200th and Aurora. 01-15 Graffiti at Echo Lake Park. 01-09 Burglary at 18xx N 204th Pl through locked window. 01-11 Contact for suspicious vehicle at 177xx Aurora, yielded person with dept of corrections warrant for investigation of drug offence. 01-15 Vehicle crashed into mailboxes at 204xx 25th Ave NW then left the scene. 01-16 Male broke windows of his brother's vehicle parked at Ridgecrest 7-11. 01-16 Bipolar male flags down police and voluntarily goes to hospital. 01-17 Suspicious male at WSDOT on Dayton, demanding a job and scaring female staff. 01-17 Two females stole vodka from Ballinger Thriftway by smuggling it out in large purses. 01-18 Mentally ill male who was high made a scene at North City Safeway. 01-18 Female assaulted by ex-boyfriend. 01-18 Residential burglary - entered house through unlocked garage door. 01-19 Innis Arden maintenance worker found dead in ravine. 01-19 Subject Trespassed for sleeping on Bank of American property. 01-20 Robbery with a gun by known suspect. 01-21 Trespass turned Obstruction turned Drug arrest. Adult male booked into jail. A little more info about the maintenance worker, please? Dead as a result of a fall or ?